The toilet fill valve is the device that allows water to get into your toilet tank. They generally have some type of float on them that causes the valve to shut off when the water has reached the correct level. There are two things that are normally done with them. First adjusting them to keep the water at the proper height and Second, replacing them when the valve fails to shut off. Not sure if this is your problem? See the article 'How To Fix a Toilet' for information on all of the possible toilet issues and what needs to be done to solve them.. The valve can go bad and get to the point where even after adjusting the float, the toilet will continue to run, wasting water. Replacing the fill valve is not a difficult job, read on and learn how. A running toilet is not always caused by the toilet fill valve. A leaking flapper valve will cause the toilet to trickle into the tank and run intermittently. Does it sound like the flapper valve? Check out this article on 'Toilet Flapper Repair', for more information. A bad fill valve will usually cause the toilet to run constantly. This is a big waste of water and will cost you money on your water bill. The toilet fill valve is the device that allows the tank to fill with water to the correct level. The water is stored in the tank until the toilet is flushed. This valve uses a float to turn the water on and off. As the name implies, it is a valve, just like any other water valve it has a seal inside that keeps water from getting through when it is closed. Just like other valves the seals can wear out and the valve won't stay closed. Replacing the toilet fill valve for an experienced person is a ten to fifteen minute job. Let's assume he does not take to long to assess the problem. One service call $50 to $100 plus one fifteen minute period. Total savings could be between $65 and $135 plus parts. This repair requires that you remove the fill valve and replace it. Not hard at all. Make sure you try adjusting the float first. Adjust if down if the tank is running all the time. When the valve keeps running no matter what you do, the valve is bad. Time to replace it. Replacing the toilet fill valve involves removing it from the tank. The tank contains water, clean water, still water. You will need to take precautions to deal with any water that may spill out of the tank when it is removed. Anything that can be damaged by water should be removed from the area before the repair is attempted. Failing to drain the tank down can generate a lot of water on the floor and surrounding area. Getting the toilet partially repaired before it gets too late or the parts store closes can leave the toilet not operating. One trick is that a toilet can be flushed by dumping a couple of gallons of water quickly into it. This emulates the normal function of the tank. The method for adjusting a toilet float will vary depending on the type of fill valve you have. Older toilets may still have a ball that is attached to a rod. This type will have a screw near the valve that is used to adjust the height of the float. The water level in the tank should be adjusted so that it is near the top of the fill tube in the center of the toilet. Newer toilets will have variations of a vertical post that is in the corner of the toilet. It will have a float attached to it that controls the water that is allowed in the tank. Getting the water level right is important. 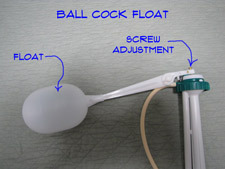 See the article 'How To Adjust a Toilet Float' for complete instructions what to do. If you have adjusted the toilet float and you cannot get the water to stop running, you may have an issue with the toilet fill valve. When the valve won't close properly, there is not much you can do with it. There are no replacement parts for the fill valve. Replacing a toilet fill valve it the likely option. They are not expensive, maybe ten or fifteen dollars, depending on where you purchase it at. They are somewhat universal so a standard fill valve will work in most toilets. 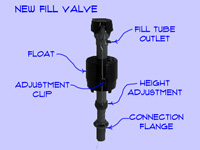 See the article 'Replacing a Toilet Fill Valve' for instructions on how to change the valve. There is some preparation involved so you are going to want to review the article.